"Don’t worry, we’ll fix it in the mix." We know it’s a cliché, but often, it’s true. 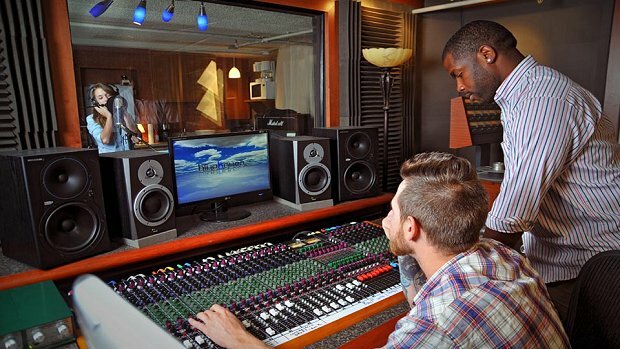 The power of recording in a controlled environment with the right tools and the right engineer means that many common flubs or mistakes can be fixed. So let’s take a look at what can be corrected – and what can’t – the next time you’re in the studio. We often start by tracking the rhythm section (bass, drums, rhythm keys/guitar, and scratch vocals) and we're always looking to capture a tight performance, hopefully within the first three takes while the energy is still high. When musicians come into the control room to listen back to these takes, the engineers are looking first and foremost for a great drum take. If there's a flub here or there on a bass line or a rhythm guitar track, that is easily fixable – but a sloppy drum track is difficult to repair. Why are drums harder to correct? First, it has to do with the fact that a drum set is actually many instruments with different microphones on separate tracks. For example, a sloppy kick drum that slows down a bit here and speeds up a bit there poses a different problem than if the bass player did the same thing. If the bass strays from the beat, it’s fairly simple to chop up the offending notes and nudge them back into time. We can even use the kick drum track to help us line things up, since the bass and kick usually work together. But if the kick drum is sloppy, we will often need to cut every drum track, since the kick drum not only has its own close mic, but is also being picked up by every other mic in the drum room. If we were to slide the close mic kick drum track only, you would still hear the timing mistake on the other tracks. "Well that’s not such a big deal," I hear you saying. "So you just have to cut and move a few extra tracks, right?" Yes and no. The problem is that while the kick drum was played, often other drums/cymbals were hit or still ringing out. When we cut and slide all the drum tracks a few milliseconds to correct the kick timing, now we introduce gaps in those other tracks which have to be fixed by manipulating them individually until those problems are corrected. In a typical four minute, 120 BPM song, you can easily have over 600 hi-hat strikes and 300 snare and kick hits, not to mention dozens of toms and cymbal hits. Even if only one percent of them have to be corrected for timing issues, you’re still looking at over a dozen edits. At some point, time is better spent going back in and doing another take. This is often one of the hardest decisions to make because whether or not further takes will yield better results is an unknown, and, in our experience, more takes usually brings out reduced energy and more frustration. If the band records to a click, there are software tools that can "automatically" correct the timing by looking at the track’s transients and pulling every hit to the closest beat, but this software often leaves a lot to be desired. First, it needs lots of tweaking after the fact to compensate for incorrectly moved beats. Secondly, it tends to make performances sound mechanical because the "groove" gets lost. You can "apply" a groove to the track either from another track (say, the bass player’s track) or from a preset, but, at this point, we’re crossing the line into "why not just use a drum machine plug-in" territory. Once a drummer makes it over the hurdles of timing issues, he or she doesn’t have to worry about the obstacles we’ll cover in part two: pitch problems. If a bass player hits an occasional wrong note in his or her bass line, that’s an easy fix. We can either re-record over those parts and cut in the correct notes, or we can correct the offending notes with pitch correction software (PCS). Rhythm guitarists almost always have to re-take those flubbed parts because chords are multi-notes that PCS has trouble identifying – but, again, it’s a fairly fast and painless process to re-dub a part while the gear is still set up. Vocals are another matter for another column, so come back next month to learn all about fixing pitch problems in your vocal tracks. Zac Cataldo is a musician and owner/producer at Night Train Studios, a recording studio in Westford, MA. He is also co-owner of Black Cloud Productions, a music publishing company. Reach him at zac@nighttrainstudios.com. Brent Godin is a bassist/guitarist and engineer/producer at Night Train Studios. He is also a talent scout at Black Cloud Productions. Reach him at brent@blackcloudproductions.com.